This celestial region was captured by the Hubble Space Telescope. It reveals the never-ending beauty of a galaxy located more than 90 million light-years from Earth (in the northern constellation of Camelopardalis). NGC 2146, its designated name, is a barred spiral galaxy that is unlike our galaxy and others of its kind. 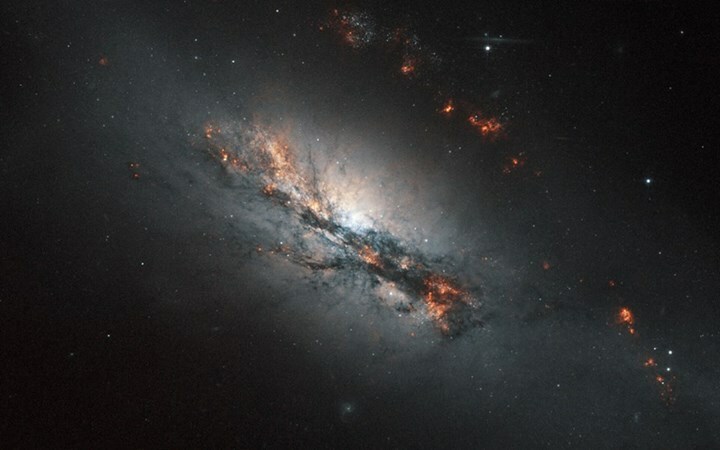 This is due to one of its spiral arms having looped around the galaxy’s core, which deformed the galaxy’s overall shape, spawning a new wave of star formation relative to our point of view (in front of the galactic center, instead of being buried by the surrounding dust clouds). It is typically unusual for galaxies such as NGC 2146 to see such a huge spike in star production at this phase of galaxy evolution, so it’s likely that the region recently devoured another galaxy several hundreds of millions of years ago (from our perspective). We are just now witnessing the after-effects of that merger, the light began its journey more than 90 million years ago. The Olbers’ Paradox: Why is the Night Sky Dark? Extremophiles, Comets, and Alien Organisms: How did life on Earth Begin?